Orchids In The Window tapestry shows a gorgeous pot of orchids in a bedside window. 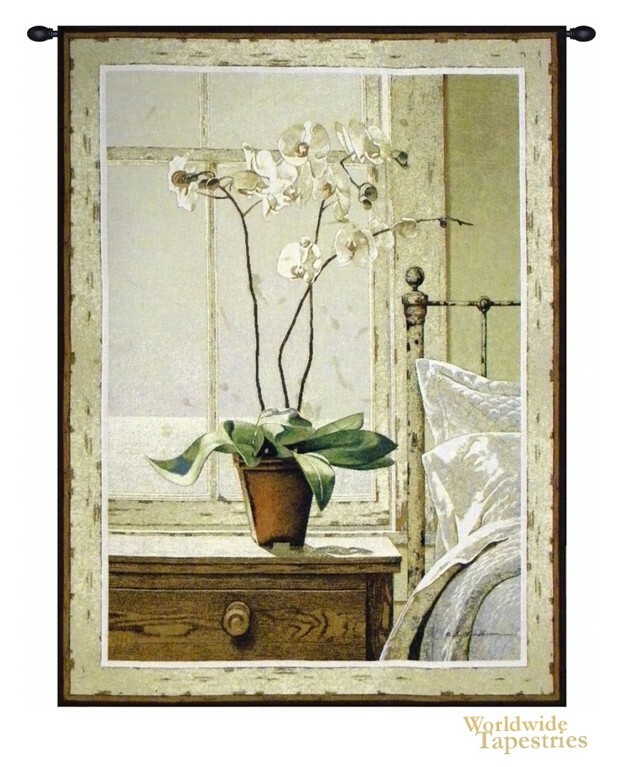 The play of light and color in this piece is simply wonderful as we see the pot of orchids with white flowers, and rich green leaves, against the elegant and subdued, beige tones. The textures of the distressed wood window, bedposts, table and bed sheets and pillows are rendered beautifully. Orchids In The Window tapestry is backed with a lining and has a tunnel for easy hanging. Note: tapestry rod and tassels, where pictured, are purchased separately. Dimensions: W 39" x H 53"